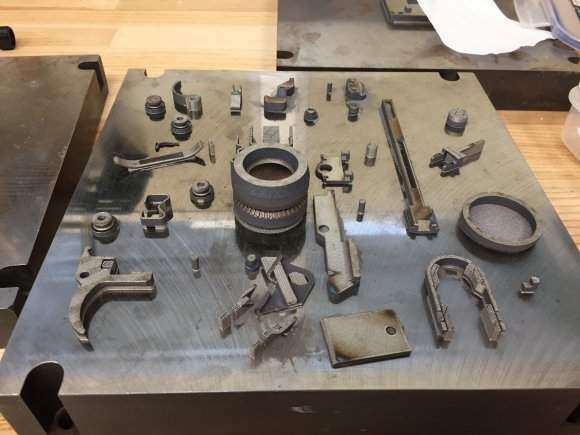 No longer an expensive niche process for prototyping, 3D printing has joined traditional manufacturing methods as a go-to technique for producing military technology. Its importance was highlighted when funding for it was earmarked in the 2018 US military budget. Berenice Baker asks why the DoD is making this investment, and examines recent US military projects that could signpost the types of projects that could benefit. 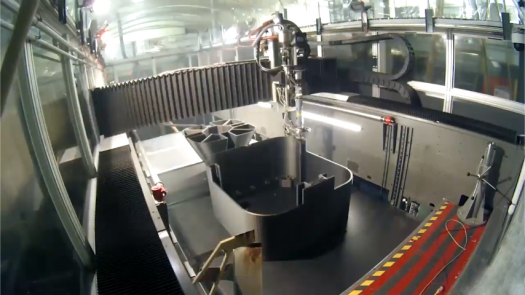 The US Navy’s Disruptive Technology Lab teamed up with the Manufacturing Demonstration Facility (MDF) of the Oak Ridge National Laboratory (ORNL) to 3D print a hull for an optionally manned demonstrator. Credit: ORNL. With the demand for maritime surveillance on the increase, navies need to build submarines faster and incorporate new design features. Credit: ORNL. RAMBO is a new 3D printed grenade launcher designed by the US Army’s Armament Research, Development and Engineering Center (ARDEC). Credit: US Army. 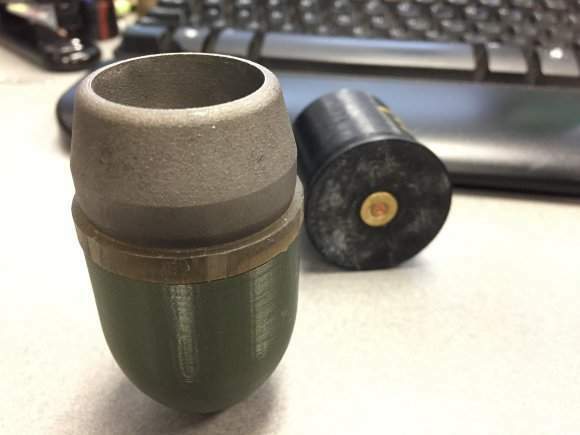 ARDEC first test fired a 3D-printed round using RAMBO last March. Credit: US Army. The RAMBO's components (except springs and fasteners) are produced using AM techniques. Credit: US Army. The military was quick to pick up on the potential for 3D printing, also known as additive manufacturing (AM), when it was first developed in the early 1980s. In an industry where parts have to fulfil any number of regulations and often be backwardly compatible for decades, it found its niche in prototyping, where a single solid object is worth a thousand computer models. As the technology developed, it could be used to put together different materials in new ways, resulting in stronger, lighter components, such as aircraft wings or armour. Improved communication bandwidth meant patterns to build components layer-by-layer could be transmitted almost instantly to remote locations that hadn’t previously known they needed a part until something went wrong. This could be a ship on a lengthy mission at sea or even the International Space Station. And now printers are smaller, lighter and more economical, it makes better logistical sense to send one to the front line with a supply of raw materials than maintain an inventory of parts for every eventuality, or transport parts across enemy territory to a war-torn frontline. So this new tranche of investment by the US DoD comes as little surprise. Yet to be approved by Washington, the budget hints at rather than sets out the exact 3D printing solutions it has in mind. Presented by the Subcommittee on Emerging Threats and Capabilities it suggests the “significant possibilities that additive manufacturing, or 3D printing, will provide to the Department of Defense, both in revolutionising the industrial supply chain, as well as in providing radically new technological capabilities”. The Subcommittee on Emerging Threats and Capabilities was responsible for setting aside $13.2bn for 3D printing of the overall $639.1bn proposed defence budget. While a significant sum, it pales into significance against the cost of maintaining depots full of inventory, plus the regular audits and disposal of out-of-date items than entails. And there will be economies of scale – the subcomittee recommends increasing the numbers of 3D printers to “tactical levels”. However, it could herald a change of thinking for defence manufacturers. Instead of contracts to supply spares, they could find themselves signing intellectual property agreements to provide the 3D printing pattern instead. But it’s not all about spares. Recent US military projects have demonstrated how entire weapons systems and their ammo – and even submersible vessels large enough for humans to travel in – can be 3D printed from the ground up. 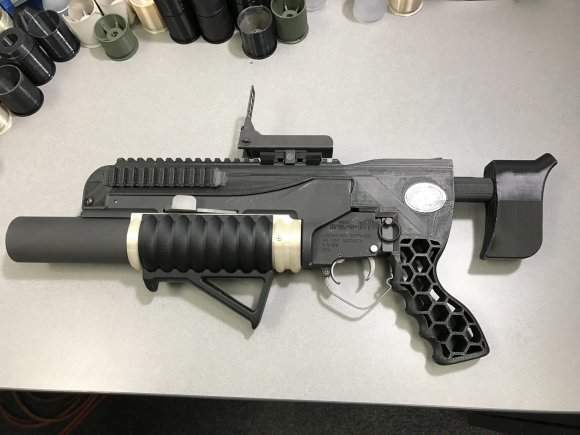 Engineers at the US Army’s Armament Research, Development and Engineering Center (ARDEC) must be high-fiving themselves for coming up with the Acronym RAMBO (rapid additively manufactured ballistics ordnance) for their new 3D printed grenade launcher. After six months of collaboration with the US Army Research, Development and Engineering Command, the US Army Manufacturing Technology Program and America Makes, the national accelerator for additive manufacturing and 3D printing, ARDEC first test fired a round – also 3D printed, of course – using RAMBO last March. Built to the specifications of the standard M203A1 launcher, every part except springs and fasteners was produced using AM techniques. The metal components were produced using a process called direct metal laser sintering, in which high-powered lasers heat aluminium particles to melting point. The demonstration aimed to demonstrate that 3D printing has the potential to produce fireable weapons prototypes rather than to replace traditional manufacturing methods. Print-and-fire weapons are still a level of sophistication away – the barrel and receiver needed to go through a number of additional post-build processes including tumbling and hard-coat anodising to safely fire. However, additive manufacturing could mean fixes and improvements to weapons are delivered to soldiers much faster in future. With the demand for maritime surveillance on the increase, navies use manned and unmanned submersibles to deploy sensors and to provide logistics capabilities. When no two missions are identical, there’s a need to build these vessels faster and incorporate new design features. 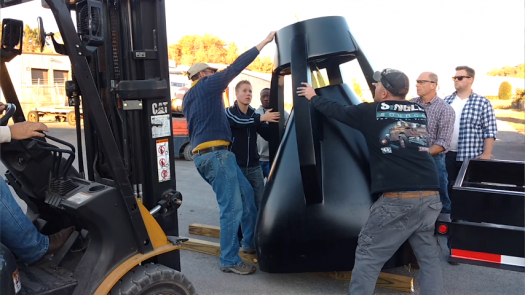 The US Navy’s Disruptive Technology Lab teamed up with the Manufacturing Demonstration Facility (MDF) of the Oak Ridge National Laboratory (ORNL) to 3D print a hull for an optionally manned demonstrator. The prototype was set to be 9.1m long and 1.4m in diameter, which meant a regular size printer wouldn’t be up for the job. So they used big area additive manufacturing, the world’s first industrial size 3D printer developed by Cincinnati Incorporated in partnership with ORNL, which boasts a print area of just over 6m in length. After a week of design work, it took a further two weeks of round-the-clock printing using a carbon-fibre composite material to have the six pieces of the hull ready to assemble. According to the US Office of Energy Efficiency and Renewable Energy, ORNL’s parent agency, this compares with the three to five months it takes to manufacture a hull using traditional technology and at just 10% of the usual $600,000 to $800,000 cost. Despite this version not being seaworthy, the team were awarded the US Naval Sea System Command Commander’s Award for innovation for proving the concept of printing on-demand vessels. They’ve now received the green light to build a second watertight version that will be tested in the manoeuvring and seakeeping wave pool at the US Naval Surface Warfare Centre in Carderock, Maryland. If all goes well, fleet-capable 3D printed submersible prototypes could follow by 2019. These projects demonstrate that 3D printed military prototypes can be produced faster, cheaper and using less energy that traditional methods, and new investments like the DoD’s could signal a sea-change in the use of AM. But while replacement parts and significant sub-systems like aircraft wings are already being printed on demand, the technology still isn’t up to the job of creating combat-ready systems from scratch without the kinds of finishing processes that require a fully equipped manufacturing capability. However, as the technology edges towards print-on-demand capability, future commanders could assess a combat operation and build the vehicles, surveillance tools, weapons and ammo they need from scratch, eliminating a long wait for a logistics delivery across hazardous terrain.